Water scarcity, regional conflict zones, and the “youth bulge:” these are all problems that may become the Marine Corps’ business in the near future. 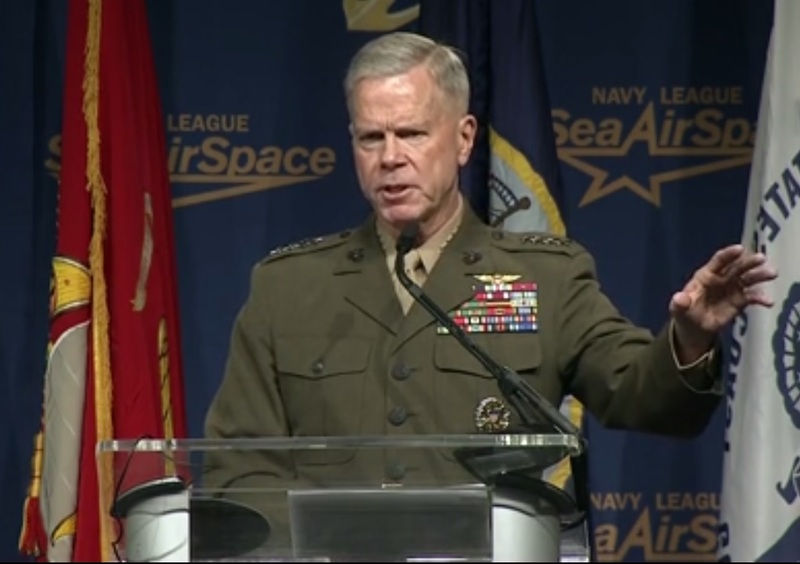 That was the message from Marine Corps Commandant Gen. James Amos this week when he gave an audience at the Navy League’s Sea Air Space expo a glimpse into what’s ahead for the Corps. By 2020, he said, expect two new crisis Marine Corps crisis response forces positioned near potential conflict zones and a rotational force established in Guam like the one already conducting training deployments in Australia. Amos also indicated that the future of the Corps will focus significantly on the African continent, home to massive resources, but also poverty, instability, and conflict. 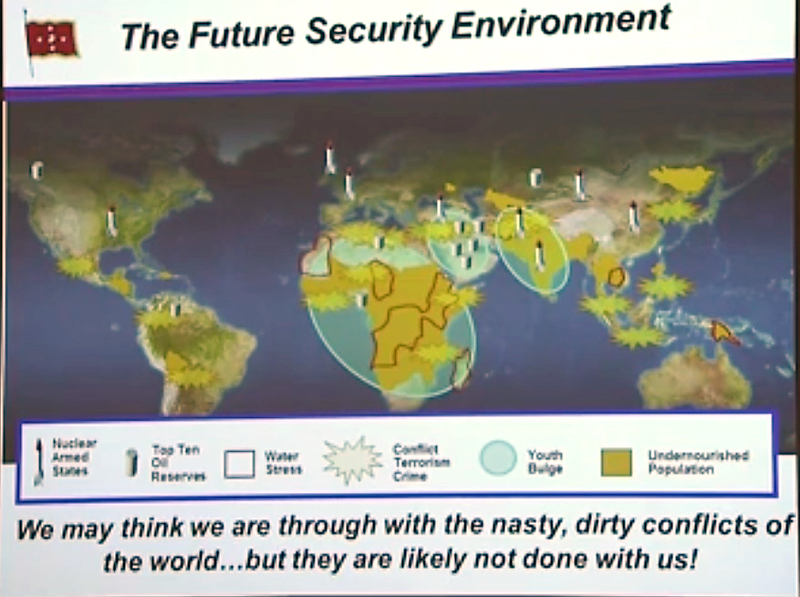 In a briefing slide depicting potential future crises, Amos showed a map depicting likely causes of conflict and instability. Some global stressors, such as nuclear armed states and areas of terrorist activity, were self-explanatory; others, such as water stress, and the “youth bulge,” were less intuitive. Regarding water stress, highlighted in much of Africa, Amos said this factor is important to watch because it drove behavior. “In those areas especially in the African continent, a gallon or a liter of clear fresh water, potable water, is worth more than a liter of petrol,” Amos said. The youth bulge, also covering most of Africa and a portion of the Middle East, referred to regions where the population was increasing, in some places exponentially, Amos said. 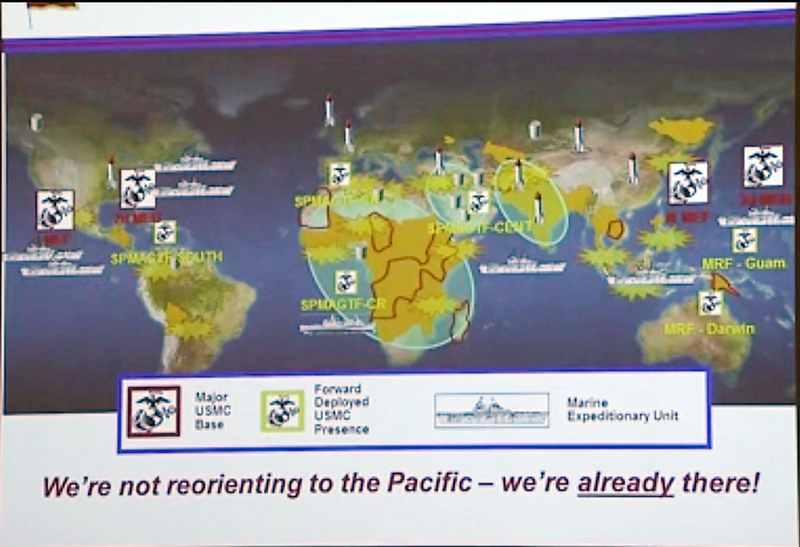 A map showing the Marine Corps in 2020 overlays global conflict and crisis zones with forward-deployed Marine units. The continent of Africa will be surrounded on three sides by Marine Corps crisis response units as Special Purpose-Marine Air Ground Task Force Crisis Response finds a forward-staged location in the Gulf of Guinea, in addition to its current location in Europe, and is joined by SP-MAGTF Cent, covering U.S. Central Command. Meanwhile, another crisis response force, SP-MAGTF South, will give U.S. Southern Command additional power to combat drug-related crime in central and South America. And by 2020, the long-promised Marine Rotational Force-Guam will also be established, Amos said. All this will give the Marine Corps greater presence in the Pacific, but also expand its crisis response presence around the larger land masses to the west, where burgeoning conflict zones have been identified. So basically in order to keep America safe we have to go looking for problem areas? The president has already decreased staff , so your plan is to stretch what we already have in the corp so thin even thinner ? This is only going to create more divorce , more suicides and increase violence. I really wish you would worry about fixing that first and keeping America safe before other areas.